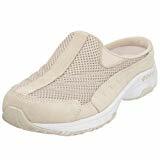 A comfortable pair of walking shoes is mandatory for senior people who still want to live an active lifestyle. And if you don’t have the time to search for the best senior walking shoes yourself, we’re here to help you out. After conducting our own thorough research and reviewing numerous items on the market, we came to the conclusion that a reliable product you should consider is the Merrell Encore Gust. These shoes are made of full grain leather and are available in two colors – smooth black and brown. They come with air cushions in the heel to absorb shocks and relieve tension when walking, and also feature rubber outsoles to reduce leg fatigue. If these shoes are not available right away, a good alternative in terms of comfort and design would be the Propet M3851 Slip-On. If it is comfort you seek, these shoes are a great option in this sense, as they are designed particularly for seniors and people with foot and back pains. They come in black and brown, and they are made from full grain leather. The correct foot position is ensured by the air cushions in the 2 inch heels that are designed to absorb shocks, and maintain your feet comfortable. A few cases were reported regarding the shoes being a bit larger than the usual sizing. Keep this in mind before you order a pair. This is a great option for comfortable foot support and painless walks. Available in black and white/navy, these shoes can be matched with any outfit. They are designed to reduce back, leg, and joint pains. Being made from leather and synthetic fabric, you can wear them regardless of the weather. They are an excellent choice in the rainy season, but they provide suitable air ventilation to your feet even during hot summer days. Some customers complained about the shoes being too narrow. If you have wider feet, perhaps it would be wiser to try them on before buying them. An excellent choice for people seeking comfort for any weather conditions. An option worth considering is a pair of shoes made from suede/leather and textile which ensures durable quality. These shoes are designed for women, and come in a wide range of colors. The cushioned insoles offer increased comfort for your heels, while the flexible outsoles provide freedom of movement. They are comfortable and will help reduce joint and back pains. Before ordering this pair of shoes, make sure you read the size chart and reviews carefully, as there have been some issues reported in this sense. 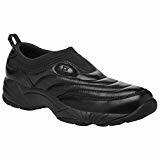 Long-lasting and comfortable, any senior can enjoy these shoes. Although listing all the comfortable and reliable shoes for seniors would be impossible, we do have a list of favorites. Here we present to you our top eight picks and showcase them below along with their main characteristics so you get to choose from some of the most popular models available. Although not necessarily a stylish option, these shoes are extremely comfortable. They are specifically designed for elders and people with back and foot aches. They are made of full grain leather and are available in two colors – black and brown. The heel measures approximately 2 inches which will ensure a correct foot position and will keep your feet comfortable throughout the day. The specific Merrell air cushions in the heels will absorb shocks and diminish the risk of swollen feet. In addition, the molded EVA foot frame adds stability and comfort. The shoes feature rubber outsoles that are both reliable and will increase the flexibility of your feet, allowing you to step easily. These outsoles will also reduce feet fatigue and will prevent blisters or calluses. And, thanks to the mesh lining, your feet will breathe accordingly and will stay dry throughout the day. Most of the customers who ordered the shoes said they run true to size, so just make sure to measure yourself correctly before purchasing the product online. Don’t forget to also find the right width so these shoes won’t be too tight and cause additional health issues like swollen feet, calluses or bunions. These shoes are available in two colors – black and white/navy, which allows you to match them with everything in your wardrobe. They are extremely comfortable to wear and will support your feet to reduce joints, leg, and back pains. The shoes are made of leather and synthetic fabric so you can wear them year-round regardless of the weather conditions. They are perfect for the rainy season and for autumn but, thanks to the mesh and fabric insert, will provide proper air ventilation to your feet, keeping them cool and dry even during the hot summer days. The rubber sole provides a firm grip and extra comfort to your feet and legs, reducing leg fatigue and eliminating pains. Moreover, the nylon-lined insole is removable and will help keep your heels dry. Another important feature of these shoes is the slip-on design which makes them easy to put on, especially for people with reduced mobility. This way you’ll be ready in just a matter of seconds and won’t require the help of another person to get dressed. Moreover, you won’t have to deal with laces which can easily untie and cause accidents you will later regret. These shoes are made of suede/leather and textile, ensuring high-quality that will last for many years from now on. They are specifically designed for women and are available in more than a dozen colors, including red, navy, pink, and ivory. Thus, you can easily match them with the rest of your outfit or purchase a pair for every outfit you have in mind. And who doesn’t want to look good while still enjoying the perks of orthopedic shoes? They feature a cushioned insole that will offer increased comfort and relief for your heels, absorbing the shocks while maintaining a natural position for your feet. The flexible outsole provides maximum freedom of movement for your legs, supporting all your steps, and helping you reduce back and joint pains. This way you can enjoy your favorite outdoor activities, from running errands to shopping, playing with your grandchildren in the park or even performing soft workout routines. The slip-on design is extremely convenient so you can easily put the shoes on. There are no extra buckles or laces, so you’ll be ready to go out in just a matter of seconds. For those who are looking for fancier shoes for seniors, this pair from Hush Puppies should definitely be on your shopping list. The shoes feature a modern and elegant design and are available in numerous colors to match the rest of your wardrobe. They are perfect for casual wear, sports, and even elegant events but won’t feel as uncomfortable as regular shoes. They are made of superior quality leather, which allows you to wear the same pair year-round, including during the rainy and cold days. Nevertheless, they remain incredibly breathable so your feet will stay cool and dry regardless of the temperatures outside. The outsole provides a good grip and will help absorb shocks. Thus, you’ll enjoy your walks and outdoor activities even more, without feeling the pain of every pebble or road hump on the street. The heel measures approximately 1.25 inches, so you won’t risk wetting your legs on a rainy day. In addition, these shoes feature a contoured EVA footbed that is removable and breathable, keeping your feet dry throughout the day. Most customers who ordered this product said it runs true to size, so we suggest ordering your regular shoe size. These shoes are available in numerous women’s sizes and widths, so you can make sure you find the perfect fit no matter how narrow or wide your feet are. They come in various colors too so you can easily match them with the rest of your daily outfit. We recommend you to order a pair in each color as these shoes will most likely become your number one choice for all your outdoor activities from now on. After all, no woman ever said she has too many pairs of shoes. They are made of superior-quality leather that’s super soft and comfortable to wear the entire day. The heel measures approximately 1.5 inches while the platform is about 1 inch tall, so it will absorb most shocks and won’t put extra pressure on your feet. Thus, you’ll enjoy a comfortable walk and you’ll be able to move freely regardless of your age. What we really liked about these shoes is the quilted upper part that is machine washable, eliminating all nasty odors, bacteria, and fungus. In other words, your feet will remain fresh and protected for a longer period of time. If you’re looking for a comfortable pair of shoes to wear all day long, this one from the reputed brand Hush Puppies could prove a smart choice. They are available in a wide array of sizes, and the unisex design makes them perfect for both men and women. So make sure to measure yourself accordingly and order the right size for you. The casual look of the shoes goes perfectly with streetwear and sportswear attires, so you can take them with you while running your daily errands or performing a mild workout routine. The shoes are made of superior quality leather that is extremely comfortable and soft. The rubber soles complete the look by adding increased stability and a good grip. The heel measures approximately 1 inch and the platform approximately 0.5 inches, providing a good balance that will keep your feet safe while reducing leg fatigue, cramps, and back and joint pains. What we also liked about the shoes is that they come with a patented lining and a removable molded footbed for extra comfort. This way, your feet will remain protected and your heels will thank you for not adding extra pressure on them. This product is made of a combination of top-quality leather and fabric, ensuring a proper air ventilation that will keep your feet cool and dry throughout the day. They are mainly designed for the warm season so avoid wearing them during winter or on rainy days if you don’t want to get your feet and socks wet easily. The unique combination of leather and fabric provides a comfortable and flexible design that will keep your feet protected for a long time from now one. The synthetic sole provides a good grip and offers increased stability with every step. The heel is approximately 1 inch tall, perfect for keeping your feet comfortable and possibly alleviating the spread of varicosity. The polyester lining will absorb excess sweat and moisture, keeping your feet dry and fighting against bacteria and bad odors. The shoes are available in four different colors and numerous sizes, so you’ll easily find the perfect fit for you, no matter if you have narrow or wide feet. Keep in mind that a pair of shoes that’s too tight will create discomfort while a pair that’s too loose will decrease your flexibility. If you’re in the market for an en-vogue pair of comfortable shoes, New Balance is probably the most popular choice for you. The company is known for launching hundreds of models of shoes and sneakers that will even satisfy the needs of picky clients. This particular product is specifically designed for men and is available in five different colors that will perfectly match the rest of your wardrobe and outfits. The slightly retro design is surprisingly comfortable and provides maximum mobility and freedom of movement for the entire day. Thus, you can enjoy your favorite outdoor activities without worrying about swollen feet, blisters, calluses or joint pains. The Velcro closures will help you put the shoes on and take them off easily, without requiring the assistance of another person. You can also adjust their fit to ensure they are comfortable for long walks or daily errands. These New Balance shoes are ideal for walking, jogging or playing with your grandchildren in the park and will promote healthier legs and feet. The heel and platform will absorb all shocks and prevent you from injuring yourself while walking. In time and with the right supplements you will regain your mobility and flexibility. Finding reliable senior walking shoes available for sale could prove a tricky quest, especially with so many great options available on the market. We hope that our following buying guide will provide you with the right insights and help you easily pick the best walking shoes for seniors in the shortest possible time. Forget all about extravagant shoes or luxurious designs as after a certain age it’s all about comfort. Unfortunately, most cheap senior walking shoes come with doubtful designs that will add at least one decade to your apparent age if you don’t accessorize them accordingly. However, there are still plenty of brands that offer quality shoes at affordable prices that are both comfortable and stylish for seniors. In terms of design, most of these shoes will feature rounded toes and a heel and platform for added support. Obviously, some good senior walking shoes will have to fit you properly. Make sure to measure your feet carefully and then compare your measurements with the ones offered by the manufacturer’s sizing guide. Keep in mind that sizes can differ from one brand to another and, sometimes, from one model to another with the same brand. Most senior people also deal with bunions, swollen feet, varicosity, and water retention, which means they will often require wider shoes. Make sure to look for shoes with a wider fit instead of the narrow or regular one. This will also allow you to wear an extra pair of socks if the weather is cold. And, if you don’t know exactly what to pick, reading some online senior walking shoes reviews could prove helpful. Customers often rate shoes based on their fit as opposed to the stated size, so look for the items with the most reviews. Unfortunately, age comes with the loss of cartilage and important amounts of calcium which weaken the bones and the muscles. This is why we strongly suggest that you consider a senior multivitamin complex that will improve your health and your body. Weak legs also mean that you won’t be able to wear high heels again and that you should pay more attention to the size of the heel and platform of your shoes. This is why you should always buy shoes specifically designed for older people because they come at the right height to improve your stability and relieve pain and tension. Orthopedic outsoles are a great solution if you want to keep your feet protected and have the shoes absorb all shocks. Make sure to combine a good pair of shoes with the right osteoporosis treatments for maximum efficiency. After all, you don’t need a walking stick just yet. In terms of materials, it would be best to pick shoes according to your lifestyle choices and the season in which you want to wear them. For instance, leather shoes are great for the cold and windy season while shoes made of textile fabrics, suede or other materials are mainly appropriate for spring, summer, and early autumn. Leather shoes make great gifts for retired men as long as you know their size and fit. Bear in mind that smaller shoes may lead to joint pains, calluses, and swollen feet while shoes that are too wide won’t offer the same stability and may fall out of your feet. Textile fabrics and mesh are the perfect choices for summer walking shoes because they will allow a proper air ventilation to keep your feet cool and dry throughout the day. Lastly, the shoes you are about to purchase should define your lifestyle. Keep in mind that if you don’t enjoy an active lifestyle you may deal with mobility issues and further joint and back pains. This is why it is important to buy some senior exercise equipment and start your own workout routine to keep your bones and muscles strong. And while we’re at it, we think that a new digital blood pressure bracelet combined with the previously mentioned exercising equipment would make thoughtful gifts for grandparents for their birthday. These accessories will improve your health and help you stay active with the help of the right pair of walking or exercising shoes.